Oh, this post is not related to any plant based diet, but actually a fun activity we did.. It is always nice to find activities that do not involve electronics. My kids love electronics and TV. They do play sports, but if they are at home they spend lots of time with electronics. I enjoy when they play something else. And this was a great buy. Since they play and enjoy it. Last night they played a couple of matches. It is not the type of fingerboard game that you may think of. I actually was not aware that there was this type of fingerboard. What we did is similar to a pool game but with your fingers. I explain it here, but the best is that you watched the video of the match. The game consists of a board, 19 discs and two strikers. The game can be played by two or four players. There are 19 discs, 9 red and 9 white and one black disc. The discs need to be placed in the center wheel. Alternate the colors. The black disc, called donkey, goes in the center. Each player then gets a striker. The aim of the game is to pocket all the discs in the pockets. There are four pockets, one in each corner. The donkey needs to be pocketed last, after a player pockets all the discs of one color. To start the game, the players chose the color of the discs, and chose who will strike first. The player need to shoot from the half circle. If a player pockets a disc, he gets another turn. If the players pockets the striker, then he is penalized by taking one of the discs already pocketed, and placing it back on the board. The donkey must not be pocketed before a player pockets all his discs. If he pockets the donkey before all his discs, he is penalized. IN this case he needs to take half of the discs that he has pocketed and place them back on the board. Once the player has pocketed all the discs then he can pocket the donkey. If he does so, he will win the match. We had great fun. I have searched Amazon for this board and I could not find it. It is probably a local board game. When you search for fingerboard in Amazon you get this . If you are familiar with the game, please comment below. If you know it by another name, please also comment below. I would love to know. What is a Starch Based Diet? i purchased the finger board about twenty years ago and all my children absolutely loved it , but unfortunately it has been packed away for a few years now, and I had to googol to find out the rules again. Thank goodness for your website explaining it all again as I have lost the rules over the years. Thank you again as now the grand children want to play. I am glad that my post help you. I hope your grandchildren have lots of fun. We had this game growing up and I have fond memories of us playing as a family for hours of fun. I have searched the web to try to purchase this but can only find it retailing in South Africa. Would love to know how I can get one of these again in the UK. Thanks for visiting my website. We bought it at a shop in South Africa. I would not know where to get it in the UK. It is a pity that these types of games are not available any more. We have lots of fun as a family with it. Sorry about it. Hi Sandra. Have just had one delivered by http://www.bothabiltongboxes.com. Not cheap, but handmade and excellent service. Thanks Debi for your input. Good to know. 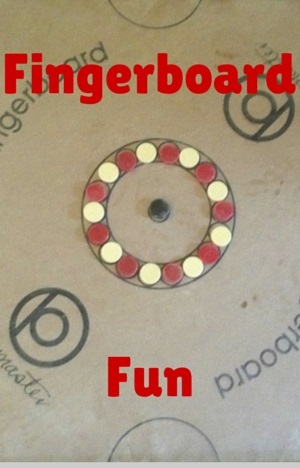 am just letting you know about the little history of the finger board game. Thank you for the history. I am living in South AFrica. Many people were wondering where to get one. Thanks for visiting my site. I urgently need fingerboards and goons, can you supply? I’m now in England and was hoping to find someone who could post me one from there…. We got ours from Mr Price. I could find out if they would ship overseas. Or if you want, I could find out how much it would cost to ship. And I can ship it to you. Ill check with Mr Price and let you know. Have a great New Year. Thank you., BUt that url does not seem to wor. Does anyone know if it sells or ships anywhere in USA? Hi Guys, I just picked up one from Big Bucks in PE (second hand), however Sportsmans Warehouse are also selling them. I had to go there to buy the discs as the board I bought didn’t have them. Gonna be loads of fun! Glad you could get one Monique. Tony, thank you for commenting. Yes, we prepped it with baby powder. My kids have forgotten about this game now. We should bring it out again. Thank you for visiting my blog and I hope you are having a great time wherever you are. I found a site on FB. FingerboardsR’Us. Its in Australia. They apparently ship wordwide. We made ours ourself but got the goons from family in Namibia. Visit http://www.fingerboardsrus.com.au for a quote. Shipped worldwide. I only saw this message now. Do you still need the measurements?